In today's world, video games have become an international entertainment phenomenon. For most gamers, it is a way to help them cope with the real world. But, does it really help? SAN DIEGO - Sept. 4, 2013 - PRLog -- In today's world, video games have become an international entertainment phenomenon. For most gamers, it is a way to help them cope with the real world. But, does it really help? Playing video games can become an addiction and not a mere emphasis to extend extreme enthusiasm, dedication, or passion towards a hobby or activity; It is the bad kind of addiction. In the May 2009 edition of the journal Psychological Science, a study by Iowa State University Assistant Professor of Psychology Douglas Gentile reports that playing video games a lot can damage the person's functioning in society. In other words a "pathological behavior" specially in gamers between the ages of 8 and 18. So, is there a better type of entertainment that is not just fun but constructive as well? Yes there is! Board games and card games have been around hundreds of years before video games came along and there is no worry about becoming addicted to them. There is never news about someone stealing a board game or a card game out of addiction. Most importantly, playing card games is fun and adults can give kids something to think about, too. 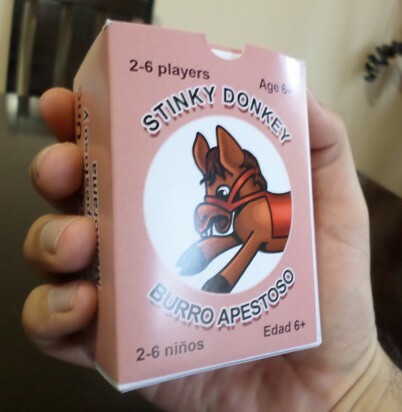 Stinky Donkey Cards Game by MarFel Games is a fun cards game for 2 – 6 players, ages 6 and up. Packaged in a convenient pocket size box that can be take to a party, family gathering, camping, or just have fun with friends and family. Each player must get rid of all the cards in their hand as fast as possible with the help of command cards and avoid the Stinky Donkey card at all times. Once all pairs have been removed from all the players, the player left with the Stinky Donkey card will be marked as a Stinky Donkey with a sticker. 49 Stinky Donkey cards, 23 Command cards, 120 Stinky Donkey stickers, 1 Rules document. The Dealer separates the COMMAND Cards from the Stinky Donkey Cards. Set the COMMAND Cards on the table. Shuffle the Stinky Donkey Cards. Deal all the cards evenly to every player. Start from left-to-right or right-to-left. Once all the cards have been dealt to every player, each player removes all the pairs in their hand. All player set the pairs aside on a stack for the dealer to check and make sure they are correct before the first turn or the game will not work correctly. First player to go is the one on the right of the dealer by picking up a COMMAND Card and following its directions. Going counter-clockwise, the players continue picking up a COMMAND Card and following the command on the card. Commands vary from taking a card from a player, giving a card to a player, no action, etc. Once a player gets rid of all the cards in his/her hand, he/she is now safe from being The Stinky Donkey. And once all the players get rid of their cards, the player left with the Stinky Donkey card will be marked as a Stinky Donkey with a Stinky Donkey Sticker. To support multilingual reproduction of the game, please visit https://www.thegamecrafter.com/games/stinky-donkey for more details.